Read this featured guest blog by triathlon mom, Cristina. Cristina has been changing and becoming a healthier and fitter mom over the years. She has seen that as she changes her habits, her husband and kids change theirs. Cristina hopes to show other moms that by helping themselves be more healhty, they are actually helping their entire family. Read her tricks to a guilt free fitness routine. To read more from Cristina, please visit www.triathlonmami.com or follow her on Twitter @triathlonmami. Once I became a mami (mom in Spanish) I got two things: a baby and a bad case of mami guilt during my fitness routine. You may not be like me, as I tend to be extreme, but my emotions together with a tsunami of hormones made me one obsessed mama. My life did not revolve around my kids: my life was my kids. But as I grew into my role as a mom, and in fairness, as my kids grew out of diapers and a little more independent, my role as a mom changed a bit. 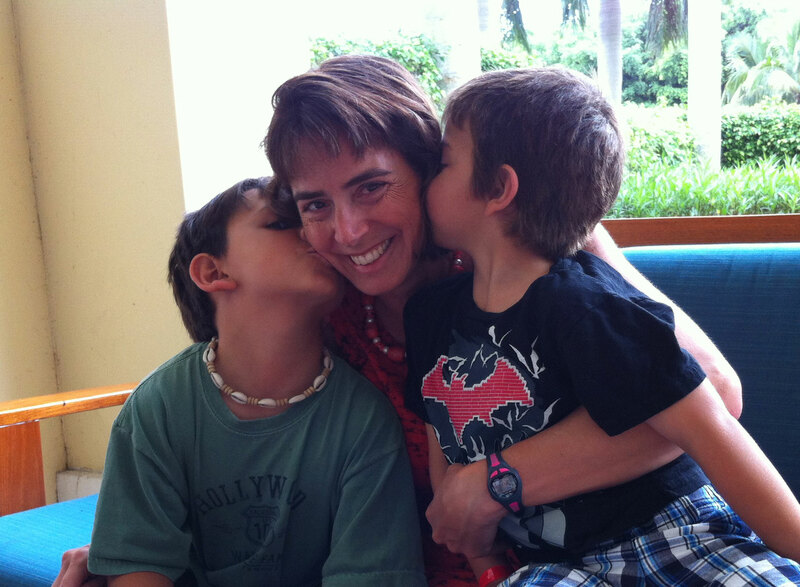 Triathlon mom, Cristina, balances raising two boys and maintaining a rigorous training schedule! At five and six my sons aren’t independent. I am still the one who serves their food, helps them get dressed and directs them as to where to be when. But they are less dependent then they used to be which opened a space for me to think of myself. Sure, that space could’ve opened a long time ago, it might have been healthy for it to have opened before, but oh well, it recently opened and I barged through.I am a triathlon mom. I train for triathlons, and I train long and hard. So when they wake up, I am not there. I am out swimming, biking and running, and get home just in time for breakfast. At night I become the bedtime nazi because after a full day of training, work and kids I am a tired mami.I know they see what I do, and I know they notice my training regimen so on days when I am feeling positive, I think I am setting a good example. First, instilling in them that fitness is important and we take time out of our day to exercise. Second, that women are strong and able to do all sorts of things. But on the days I am down, mami guilt seeps in. Sometimes I think, I am putting my triathlon training before my children, I am obsessed with fitness and my kids are suffering … look, I am feeding them frozen food because I am too tired to go to the store. It happens. In the weekday mornings, I let go of the guilt and let dad take over. During the weekday afternoons I will not be the soccer mom watching practice, I will be writing and working on my blog. But I will be the soccer mom that is there for the game and cheer as high and as loud as I can. In the car, I will talk to my boys. At dinner, I will talk to them. When I am with them, I will BE with them and not multitask sneaking in an email, a Facebook post or a tweet or chatting with a friend. I will have plenty of playdates where my kids play with their friends at home and I can be around but not need to be the entertainment. I will cook for two nights, or cook and freeze or somehow organize our meals so I am not staring at the fridge thinking “crap … I can’t deal with cooking today” and open the freezer to serve a prepared frozen meal instead. My husband does not get home until after the boys go to sleep leaving me to handle dinner, bath, bedtime on my own and by then, again, I am tired. I do forewarn the boys that “cranky mami” is upon us, but I will make a heroic effort to not let her shine. If I fail, which I most likely will at times, at least I will stop, take a breath, snuggle and read them a book. If I do these things, I know I will feel that, though not perfect … and who the heck is perfect anyways … I am giving my boys the best of me. A “me” that is healthy and is taking the time to stay fit but that gives them the attention and care they need. What are your tricks to balancing kids and your guilt free fitness routine? What an awesome post about things that most moms struggle with! I try to do most of my training early in the mornings before my hubby and kids are awake so that I’m not taking any time away from them. I usually walk in the door from running and a few minutes later they wake up. So they see that mom has been running but she’s there for them when they wake up. Yes, I agree! I try to get in some of my workouts fairly early, or when my daughter is sleeping too. I work full-time, so I feel better about my workouts if I can do them during her sleeping hours, but even when I workout when she is awake, I never regret my workouts!